Below is a very good article that everyone should read to better understand why the economy imploded in 2008: it was as a result of literally decades of risky and in frankly socialist decisions implemented primarily by GSEs Fannie Mae and Freddie Mac. But allow me to say a few words before getting to the full article. The Democrat Party/lamestream media narrative is that Bush was responsible for the economic meltdown because it “happened during his watch.” There was never once a mention that it happened during Nancy Pelosi’s and Harry Reid’s watch. Because that particular narrative doesn’t fit their leftist agenda. I can very easily explain why Democrats were the primary cause of the 2008 collapse. Or how about watching John Stossel explain what happened in a 5 1/2 minute ABC 20/20 piece? Do you really want to know the true origins of the financial collapse? Then please do a little reading and start learning. The mortgage market collapsed in 2008 because of its biggest player: Fannie Mae, which held some 60% of the mortgages. And Democrats were entirely behind the policies that led to the collapse of Fannie Mae and the private mortgage industry that bought Fannie’s mortgage-backed securities. Investors were falsely led to believe that the bonds they were buying were guaranteed implicitly by the federal government. What about Fannie Mae and Freddie Mac that got there with the support of the Democrats in Congress. That’s what kicked off the great housing bubble; that’s what started this whole thing rolling down the hill. Did they ever talk about that kind of excess in the congress? No…..this isn’t something that is just due to the “Wall Street community”. So to answer your question, it was DEMOCRATS who led us into this mess. Just as it is DEMOCRATS who are now making the mess far worse. I would point out in addition that Republicans deserve condemnation because they lacked the political courage and the political will to oppose enormously risky Democrat policies rather than face the demagoguery that they were “racist” for not allowing low-income minorities to own their own homes. So they allowed the Democrats to keep expanding the Community Reinvestment Act, and allowed them to keep expanding the portfolio of Government Supported Enterprises Fannie Mae and Freddie Mac. The following AEI article from Peter Wallison and Charles Calomiris is also available as a PDF file. The government takeover of Fannie and Freddie was necessary because of their massive losses on more than $1 trillion of subprime and Alt-A investments. The government takeover of Fannie Mae and Freddie Mac was necessary because of their massive losses on more than $1 trillion of subprime and Alt-A investments, almost all of which were added to their single-family book of business between 2005 and 2007. The most plausible explanation for the sudden adoption of this disastrous course–disastrous for them and for the U.S. financial markets–is their desire to continue to retain the support of Congress after their accounting scandals in 2003 and 2004 and the challenges to their business model that ensued. Although the strategy worked–Congress did not adopt strong government-sponsored enterprise (GSE) reform legislation until the Republicans demanded it as the price for Senate passage of a housing bill in July 2008–it led inevitably to the government takeover and the enormous junk loan losses still to come. Now that the federal government has been required to take effective control of Fannie and Freddie and to decide their fate, it is important to understand the reasons for their financial collapse–what went wrong and why. In his statement on September 7 announcing the appointment of a conservator for the two enterprises, Treasury Secretary Henry M. Paulson pointed to their failed business models as the reason for their collapse. This was certainly a contributing element, but not the direct cause. The central problem was their dependence on Congress for continued political support in the wake of their accounting scandals in 2003 and 2004. To curry favor with Congress, they sought substantial increases in their support of affordable housing, primarily by investing in risky and substandard mortgages between 2005 and 2007. As GSEs, Fannie and Freddie were serving two masters in two different ways. The first was an inherent conflict between their government mission and their private ownership. The government mission required them to keep mortgage interest rates low and to increase their support for affordable housing. Their shareholder ownership, however, required them to fight increases in their capital requirements and regulation that would raise their costs and reduce their risk-taking and profitability. But there were two other parties–Congress and the taxpayers–that also had a stake in the choices that Fannie and Freddie made. Congress got some benefits in the form of political support from the GSEs’ ability to hold down mortgage rates, but it garnered even more political benefits from GSE support for affordable housing. The taxpayers got highly attenuated benefits from both affordable housing and lower mortgage rates but ultimately faced enormous liabilities associated with GSE risk-taking. This Outlook tells the disheartening story of how the GSEs sold out the taxpayers by taking huge risks on substandard mortgages, primarily to retain congressional support for the weak regulation and special benefits that fueled their high profits and profligate executive compensation. As if that were not enough, in the process, the GSEs’ operations promoted a risky subprime mortgage binge in the United States that has caused a worldwide financial crisis. The special relationship with Congress was the GSEs’ undoing because it allowed them to escape the market discipline–the wariness of lenders–that keeps corporate managements from taking unacceptable risks. The peculiar structure of the GSEs–shareholder-owned companies with a public mission–reflected a serious confusion of purpose on the part of the Lyndon Johnson administration and the members of Congress who created this flawed structure in 1968. In seeking to reduce the budget deficits associated with the Vietnam War and Great Society programs, the administration hit upon the idea of “privatizing” Fannie Mae by allowing the company to sell shares to the public. This, according to the budget theories of the time, would take Fannie’s expenditures off-budget, while allowing it to continue its activities with funds borrowed in the public credit markets. But turning Fannie into a wholly private company was not acceptable either. Various special provisions were placed in Fannie’s congressional charter that intentionally blurred the line between a public instrumentality and a private corporation. Among these provisions: Fannie was given a line of credit at the Treasury; the president could appoint five members of its board of directors; and its debt could be used, like Treasury debt, to collateralize government deposits in private banks. Fannie’s congressional charter and its unusual ties to the government ensured that the market would recognize its status as a government instrumentality: that despite its private ownership, the company was performing a government mission. Because it was highly unlikely that the U.S. government would allow one of its instrumentalities to default on its obligations, Fannie was perceived in the capital markets to have at least an implicit government backing and was thus able to borrow funds at rates that were only slightly higher than those paid by the U.S. Treasury on its own debt offerings. In 1970, the Federal Home Loan Bank Board created Freddie Mac to assist federal savings and loan associations in marketing their mortgages; Freddie was also allowed to sell shares to the public in 1989 and became a competitor of Fannie Mae under a congressional charter that established an identical special relationship with the government. The special relationship, codified by these unique charters, required the GSEs to pursue another inherently conflicted mission that pitted their shareholders against the taxpayers. To the extent that their government backing allowed the GSEs to take excessive financial risks, it was the taxpayers and not the shareholders who would ultimately bear the costs. That result–the privatization of profit and the socialization of risk–has now come to pass. U.S. taxpayers are now called upon to fill in the hole that reckless and improvident investment activity–fueled by inexpensive and easily accessible funds–has created in the GSEs’ balance sheets. The special relationship was also the GSEs’ undoing, because it allowed them to escape the market discipline–the wariness of lenders–that keeps corporate managements from taking unacceptable risks. Normally, when a privately held company is backed by the government (for example, in the case of commercial banks covered by the Federal Deposit Insurance Corporation), regulation is the way that the government protects the taxpayers against the loss of market discipline. When Fannie Mae was privatized in 1968, however, no special regulatory structure was created to limit the taxpayers’ exposure to loss. The Johnson administration officials who structured the privatization may not have realized that they were creating what we recognize today as a huge moral hazard, but when Fannie became insolvent (the first time) in the high-interest-rate environment of the early 1980s, policymakers recognized that the company represented a potential risk to taxpayers. In 1991, as Congress finally began the process of developing a regulatory regime for the GSEs, congressional interest in supporting affordable housing was growing. At this point, Fannie Mae initiated its first foray into affordable housing–a relatively small $10 billion program, probably intended to show Congress that the GSEs would support affordable housing without a statutory mandate. Nevertheless, Congress added an affordable housing “mission” to the GSE charters when it created their first full-time regulator, the Office of Federal Housing Enterprise Oversight (OFHEO). The new agency had only limited regulatory authority. It was also housed in the Department of Housing and Urban Development (HUD), which had no regulatory experience, and it was funded by congressional appropriations, allowing the GSEs to control their regulator through the key lawmakers who held OFHEO’s purse strings. Managing their political risk required the GSEs to offer Congress a generous benefits package. Campaign contributions were certainly one element. Between the 2000 and 2008 election cycles, the GSEs and their employees contributed more than $14.6 million to the campaign funds of dozens of senators and representatives, most of them on committees that were important to preserving the GSEs’ privileges. And Fannie knew how to “leverage” its giving, not just its assets; often it enlisted other groups that profited from the GSEs’ activities–the securities industry, homebuilders, and realtors–to sponsor their own fundraising events for the GSEs’ key congressional friends. In addition to campaign funds, the GSEs–Fannie Mae in particular–enhanced their power in Congress by setting up “partnership offices” in the districts and states of important lawmakers, often hiring the relatives of these lawmakers to staff the local offices. Their lobbying activities were legendary. Between 1998 and 2008, Fannie spent $79.5 million and Freddie spent $94.9 million on lobbying Congress, making them the twentieth and thirteenth biggest spenders, respectively, on lobbying fees during that period. Not all of these expenditures were necessary to contact members of Congress; the GSEs routinely hired lobbyists simply to deprive their opponents of lobbying help. Since lobbyists are frequently part of lawmakers’ networks–and are often former staffers for the same lawmakers–these lobbying expenditures also encouraged members of Congress to support Fannie and Freddie as a means of supplementing the income of their friends. The failure to adopt meaningful GSE reform in 2005 was a crucial missed opportunity. One of the most successful efforts to influence lawmakers came through community groups. Both Fannie and Freddie made “charitable” or other gifts to community groups, which could then be called upon to contact the GSEs’ opponents in Congress and protest any proposed restrictions on the activities or privileges of the GSEs. GSE supporters in Congress could also count on these groups to back them in their reelection efforts. But these activities, as important as they were in managing the GSEs’ political risks, paled when compared to the billions of dollars the GSEs made available for spending on projects in the congressional districts and states of their supporters. Many of these projects involved affordable housing. In 1994, Fannie Mae replaced its initial $10 billion program with a $1 trillion affordable housing initiative, and both Fannie and Freddie announced new $2 trillion initiatives in 2001. It is not clear to what extent the investments made in support of these commitments were losers–the GSEs’ profitability over many years could cover a multitude of sins–but it is now certain that the enormous losses associated with the risky housing investments appearing on Fannie and Freddie’s balance sheet today reflect major and imprudent investments in support of affordable housing between 2005 and 2007–investments that ultimately brought about the collapse of Fannie and Freddie. Even if the earlier affordable housing projects were not losers, however, they represented a new and extra-constitutional way for Congress to dispense funds that should otherwise have flowed through the appropriations process. In one sense, the expenditures were a new form of earmark, but this earmarking evaded the constitutional appropriations process entirely. An illustration is provided by a press release from the office of Senator Charles E. Schumer (D-N.Y.), one of the most ardent supporters of the GSEs in Congress. The headline on the release, dated November 20, 2006–right in the middle of the GSEs’ affordable housing spending spree–was “Schumer Announces up to $100 Million Freddie Mac Commitment to Address Fort Drum and Watertown Housing Crunch.” The subheading continued: “Schumer Unveils New Freddie Mac Plan with HSBC That Includes Low-Interest Low-Downpayment Loans. In June, Schumer Urged Freddie Mac and Fannie Mae Step Up to the Plate and Deliver Concrete Plans–Today Freddie Mac Is Following Through.” If this project had been economically profitable for Fannie or Freddie, Schumer would not have had to “urge” them to “step up.” Instead, using his authority as a powerful member of the Senate Banking Committee–and a supporter of Fannie and Freddie–he appears to have induced Freddie Mac to make a financial commitment that was very much in his political interests but for which the taxpayers of the United States would ultimately be responsible. Of course, Schumer was only one of many members of Congress who used his political leverage to further his own agenda at taxpayer expense and outside the appropriations process. The list of friends of Fannie and Freddie changed over time; while the GSEs enjoyed broad bipartisan support in the 1990s, over the past decade, they have become increasingly aligned with the Democrats. This shift in the political equilibrium was especially clear in the congressional reaction to the GSEs’ accounting scandals of 2003 and 2004. Fannie and Freddie reaped significant benefits from the careful management of their political risk. In June 2003, in the wake of the failures of Enron and WorldCom, Freddie’s board of directors suddenly dismissed its three top officers and announced that the company’s accountants had found serious problems in Freddie’s financial reports. In 2004, after a forensic audit by OFHEO, even more serious accounting manipulation was found at Fannie, and Raines, its chairman, and Timothy Howard, its chief financial officer, were compelled to resign. It is eloquent testimony to the power of Fannie and Freddie in Congress that even after these extraordinary events there was no significant effort to improve or enhance the powers of their regulator. The House Financial Services Committee developed a bill that was so badly weakened by GSE lobbying that the Bush administration refused to support it. The Senate Banking Committee, then under Republican control, adopted much stronger legislation in 2005, but unanimous Democratic opposition to the bill in the committee doomed it when it reached the floor. Without any significant Democratic support, debate could not be ended in the Senate, and the bill was never brought up for a vote. This was a crucial missed opportunity. The bill prohibited the GSEs from holding portfolios of mortgages and mortgage-backed securities (MBS); that measure alone would have prevented the disastrous investment activities of the GSEs in the years that followed. GSE immunity to accounting scandal is especially remarkable when it is recalled that after accounting fraud was found at Enron (and later at WorldCom), Congress adopted the punitive Sarbanes-Oxley Act, which imposed substantial costs on every public company in the United States. The GSEs’ investment in controlling their political risk–at least among the Democrats–was apparently money well spent. To manage this risk with little capital requires a conceptually sophisticated hedging framework. In essence, the current system depends on the risk managers at Fannie and Freddie to do everything just right, rather than depending on a market-based system supported by the risk assessments and management capabilities of many participants with different views and different strategies for hedging risks. Most of the concerns associated with systemic risks flow from the size of the balance sheets that these GSEs maintain. One way Congress could constrain the size of these balance sheets is to alter the composition of Fannie and Freddie’s mortgage financing by limiting the dollar amount of their debt relative to the dollar amount of mortgages securitized and held by other investors. . . . [T]his approach would continue to expand the depth and liquidity of mortgage markets through mortgage securitization but would remove most of the potential systemic risks associated with these GSEs. This statement must have caused considerable concern to Fannie and Freddie. Most of their profits came from issuing debt at low rates of interest and holding portfolios of mortgages and MBS with high yields. This was a highly lucrative arrangement; limiting their debt issuance would have had a significant adverse effect on their profitability. In addition, in January 2005, only a few months after the adverse OFHEO report on Fannie’s accounting manipu-lation, three Federal Reserve economists published a study that cast doubt on whether the GSEs’ activities had any significant effect on mortgage interest rates and concluded further that holding portfolios–a far risker activity than issuing MBS–did not have any greater effect on interest rates than securitization: “We find that both portfolio purchases and MBS issuance have negligible effects on mortgage rate spreads and that purchases are not any more effective than securitization at reducing mortgage interest rate spreads.” Thus, the taxpayer risks cited by Greenspan could not be justified by citing lower mortgage rates, and, worse, there was a strong case for limiting the GSEs to securitization activities alone–a much less profitable activity than holding MBS. The events in 2003 and 2004 had undermined the legitimacy of the GSEs. They could no longer claim to be competently–or even honestly–managed. An important and respected figure, Alan Greenspan, was raising questions about whether they might be creating excessive risk for taxpayers and systemic risk for the economy as a whole. Greenspan had suggested that their most profitable activity–holding portfolios of mortgages and MBS–was the activity that created the greatest risk, and three Federal Reserve economists had concluded that the GSEs’ activities did not actually reduce mortgage interest rates. It was easy to see at this point that their political risk was rising quickly. The case for continuing their privileged status had been severely weakened. The only element of their activities that had not come under criticism was their affordable housing mission, and it appears that the GSEs determined at this point to play that card as a way of shoring up their political support in Congress. From the perspective of their 2008 collapse, this may seem to have been unwise, but in the context of the time, it was a shrewd decision. It provided the GSEs with the potential for continuing their growth and delivered enormous short-term profits. Those profits were transferred to stockholders in huge dividend payments over the past three years (Fannie and Freddie paid a combined $4.1 billion in dividends last year alone) and to managers in lucrative salaries and bonuses. Indeed, if it had not been for the Democrats’ desire to adopt a housing relief bill before leaving for the 2008 August recess, no new regulatory regime for the GSEs would have been adopted at all. Only the Senate Republicans’ position–that there would be no housing bill without GSE reform–overcame the opposition of Senators Christopher Dodd (D-Conn.), the banking committee chairman, and Schumer. The GSEs’ confidence in the affordable housing idea was bolstered by what appears to be a tacit understanding. Occasionally, this understanding found direct expression. For example, in his opening statement at a hearing in 2003, Representative Barney Frank (D-Mass. ), now the chairman of the House Financial Services Committee, referred to an “arrangement” between Congress and the GSEs that tracks rather explicitly what actually happened: “Fannie and Freddie have played a very useful role in helping to make housing more affordable, both in general through leveraging the mortgage market, and in particular, they have a mission that this Congress has given them in return for some of the arrangements which are of some benefit to them to focus on affordable housing.” So here the arrangement is laid out: if the GSEs focus on affordable housing, their position is secure. Affordable housing loans and subprime loans are not synonymous. Affordable housing loans can be traditional prime loans with adequate down payments, fixed rates, and an established and adequate borrower credit history. In trying to increase their commitment to affordable housing, however, the GSEs abandoned these standards. In 1995, HUD, the cabinet-level agency responsible for issuing regulations on the GSEs’ affordable housing obligations, had ruled that the GSEs could get affordable housing credit for purchasing subprime loans. Unfortunately, the agency failed to require that these loans conform to good lending practices, and OFHEO did not have the staff or the authority to monitor their purchases. The assistant HUD secretary at the time, William Apgar, later told the Washington Post that “[i]t was a mistake. In hindsight, I would have done it differently.” Allen Fishbein, his adviser, noted that Fannie and Freddie “chose not to put the brakes on this dangerous lending when they should have.” Far from it. In 1998, Fannie Mae announced a 97 percent loan-to-value mortgage, and, in 2001, it offered a program that involved mortgages with no down payment at all. As a result, in 2004, when Fannie and Freddie began to increase significantly their commitment to affordable housing loans, they found it easy to stimulate production in the private sector by letting it be known in the market that they would gladly accept loans that would otherwise be considered subprime. Fannie and Freddie had nothing to do with the explosion of high-risk lending. . . . In fact, Fannie and Freddie, after growing rapidly in the 1990s, largely faded from the scene during the height of the housing bubble. . . . Partly that’s because regulators, responding to accounting scandals at the companies, placed temporary restraints on both Fannie and Freddie that curtailed their lending just as housing prices were really taking off. Also, they didn’t do any subprime lending, because they can’t . . . by law. . . . So whatever bad incentives the implicit federal guarantee creates have been offset by the fact that Fannie and Freddie were and are tightly regulated with regard to the risks they can take. You could say that the Fannie-Freddie experience shows that regulation works. Here Krugman demonstrates confusion about the law (which did not prohibit subprime lending by the GSEs), misunderstands the regulatory regime under which they operated (which did not have the capacity to control their risk-taking), and mismeasures their actual subprime exposures (which he wrongly states were zero). There is probably more to this than lazy reporting by Krugman; the GSE propaganda machine purposefully misled people into believing that it was keeping risk low and operating under an adequate prudential regulatory regime. There are few data available publicly on the dollar amount of junk loans held by the GSEs in 2004, but according to their own reports, GSE purchases of these mortgages and MBS increased substantially between 2005 and 2007. Subprime and Alt-A purchases during this period were a higher share of total purchases than in previous years. For example, Fannie reported that mortgages and MBS of all types originated in 2005–2007 comprised 49.8 percent of its overall book of single-family mortgages, which includes both mortgages and MBS retained in their portfolio as well as mortgages they securitized and guaranteed. But the percentage of mortgages with subprime characteristics purchased during this period consistently exceeded 49.8 percent, demonstrating that Fannie was substantially increasing its reliance on junk loans between 2005 and 2007. For example, in its 10-Q Investor Summary report for the quarter ended June 30, 2008, Fannie reported that mortgages with subprime characteristics comprised substantial percentages of all 2005–2007 mortgages the company acquired, as shown in table 1. Based on these figures, it is likely that as much as 40 percent of the mortgages that Fannie Mae added to its single-family book of business during 2005–2007 were junk loans. If we add up all these categories and eliminate double counting, it appears that on June 30, 2008, Fannie held or had guaranteed subprime and Alt-A loans with an unpaid principal balance of $553 billion. In addition, according to the same Fannie report, the company also held $29.5 billion of Alt-A loans and $36.3 billion of subprime loans that it had purchased as private label securities (non-GSE or Ginnie Mae securities). These figures amount to a grand total of $619 billion–approximately 23 percent of Fannie’s book of single-family business on June 30, 2008–and reflect a huge commitment to the purchase of mortgages of questionable quality between 2005 and 2007. Freddie Mac also published a report on its subprime and Alt-A mortgage exposures as of August 2008. Freddie’s numbers were not as detailed as Fannie’s, but the company reported that 52 percent of its entire single-family credit guarantee portfolio was from book years 2005–2007 (slightly more than Fannie) and that these mortgages had subprime characteristics, as shown in table 2. Based on these figures, it appears that as much as 40 percent of the loans that Freddie Mac added to its book of single-family mortgage business during 2005–2007 also consisted of junk loans. Freddie’s disclosures did not contain enough detail to eliminate all of the double counting, so it is not possible to estimate the total amount of its subprime loans from the information it reported. Nevertheless, we can calculate the minimum amount of Freddie’s exposure. In the same report, Freddie disclosed that $190 billion of its loans were categorized as Alt-A and $68 billion had FICO credit scores of less than 620, so that they would clearly be categorized as subprime. Based on the limited information Freddie supplied, double counting of $7.6 billion can be eliminated, so that as of August 2008, Freddie held or had guaranteed at least $258 billion of junk loans. To this must be added $134 billion of subprime and Alt-A loans that Freddie purchased from private label issuers, for a grand total of $392 billion–20 percent of Freddie’s single-family portfolio of $1.8 trillion. Fannie Mae and Freddie Mac purchased and guaranteed “many more low-documentation, low-verification and non-standard” mortgages in 2006 and 2007 “than they had in the past.” He said the companies increased their exposure to risks in 2006 and 2007 despite the regulator’s warnings. Roughly 33 percent of the companies’ business involved buying or guaranteeing these risky mortgages, compared with 14 percent in 2005. Those bad debts on mortgages led to billions of dollars in losses at the firms. “The capacity to raise capital to absorb further losses without Treasury Department support vanished,” Lockhart said. Although a large share of the subprime loans now causing a crisis in the international financial markets are so-called private label securities–issued by banks and securitizers other than Fannie Mae and Freddie Mac–the two GSEs became the biggest buyers of the AAA tranches of these subprime pools in 2005-07. Without their commitment to purchase the AAA tranches of these securitizations, it is unlikely that the pools could have been formed and marketed around the world. Accordingly, not only did the GSEs destroy their own financial condition with their excessive purchases of subprime loans in the three-year period from 2005 to 2007, but they also played a major role in weakening or destroying the solvency and stability of other financial institutions and investors in the United States and abroad. Why did the GSEs follow this disastrous course? One explanation–advanced by Lockhart–is that Fannie and Freddie were competing for market share with the private label securitizers and had to purchase substantial amounts of subprime mortgages in order to retain their position in a growing market. Fannie and Freddie’s explanation is that they were the victims of excessively stringent HUD affordable housing goals. Neither of these explanations is plausible. For many years before 2004, Fannie and Freddie had followed relatively prudent investment strategies, even with respect to affordable housing, but they suddenly changed their approach in 2005. Freddie Mac’s report, for example, shows that the percentage of mortgages in its portfolio with subprime characteristics rose rapidly after 2004. Tables 1 and 2 show that for each category of mortgages with subprime characteristics, most of the portfolio of loans with those characteristics was acquired from 2005 to 2007. For example, 83.8 percent of Fannie’s and 90 percent of Freddie’s interest-only loans as of June 2008 were acquired from 2005 to 2007, and 57.5 percent of Fannie’s and 61 percent of Freddie’s loans with FICO scores of less than 620 as of June 2008 were acquired from 2005 to 2007. It seems unlikely that competing for market share or complying with HUD regulations–which contained no enforcement mechanism other than disclosure and delay in approving requests for mission expansions–could be the reason for such an obviously destructive course. Instead, it seems likely that the event responsible for the GSEs’ change in direction and culture was the accounting scandal that each of them encountered in 2003 and 2004. In both cases, they lost their reputation as well-managed companies and began to encounter questions about their contribution to reducing mortgage rates and their safety and soundness. Serious observers questioned whether they should be allowed to continue to hold mortgages and MBS in their portfolios–by far their most profitable activity–and Senate Republicans moved a bill out of committee that would have prohibited this activity. Under these circumstances, the need to manage their political risk became paramount, and this required them to prove to their supporters in Congress that they still served a useful purpose. In 2003, as noted above, Frank had cited an arrangement in which the GSEs’ congressional benefits were linked to their investments in affordable housing. In this context, substantially increasing their support for affordable housing–through the purchase of the subprime loans permitted by HUD–seems a logical and even necessary tactic. Unfortunately, the sad saga of Fannie and Freddie is not over. Some of their supporters in Congress prefer to blame the Fannie and Freddie mess on deregulation or private market failure, perhaps hoping to use such false diagnoses to lay the groundwork for reviving the GSEs for extra constitutional expenditure and political benefit in the future. As the future of the GSEs is debated over the coming months and years, it will be important to remember how and why Fannie and Freddie failed. The primary policy objective should be to prevent a repeat of this disaster by preventing the restoration of the GSE model. Peter J. Wallison (pwallison@aei.org) is the Arthur F. Burns Fellow in Financial Policy Studies at AEI. Charles W. Calomiris (cc374@columbia.edu) is a visiting scholar at AEI and the Henry Kaufman Professor of Financial Institutions at Columbia Business School. Messrs. Wallison and Calomiris wish to thank Edward Pinto, a former chief credit officer of Fannie Mae, for his assistance in deciphering the GSEs’ descriptions of their mortgage exposures. AEI research assistant Karen Dubas worked with the authors to produce this Financial Services Outlook. Click here to view this Outlook as an Adobe Acrobat PDF. 1. Quoted in Niles Steven Campbell, “Fannie Mae Officials Try to Assuage Worried Investors,” Real Estate Finance Today, May 10, 1999. See also Binyamin Appelbaum, Carol D. Leonnig, and David S. Hilzenrath, “How Washington Failed to Rein In Fannie, Freddie,” Washington Post, September 14, 2008. 2. Common Cause, “Ask Yourself Why . . . They Didn’t See This Coming,” September 24, 2008, available at www.commoncause.org/site/pp.asp?c=dkLNK1MQIwG&b=4542875 (accessed September 29, 2008). 3. Center for Responsive Politics, “Lobbying: Top Spenders,” 2008, available at www.opensecrets.org/lobby/top.php?indexType=s (accessed September 26, 2008). 4. Owen Ullmann, “Crony Capitalism: American Style,” The International Economy (July/August 1999): 6. 5. Terry Jones, “‘Crony’ Capitalism Is Root Cause of Fannie and Freddie Troubles,” Investor’s Business Daily, September 22, 2008. 7. Funding Universe, “Fannie Mae–Company History,” available at www.fundinguniverse.com/company-histories/Fannie-Mae-Company-History.html (accessed September 29, 2008); Funding Universe, “Freddie Mac–Company History,” available at www.fundinguniverse.com/company-histories/Freddie-Mac-Company-History.html (accessed September 29, 2008); and Business Wire, “Fannie Mae’s $2 Trillion ‘American Dream Commitment’ on Course with Over $190 Billion in Targeted Lending,” news release, March 14, 2001, avail-able at http://findarticles.com/p/articles/mi_m0EIN/is_2001_March_14/ai_71707186/ (accessed September 29, 2008). 8. Office of Senator Charles E. Schumer, “Schumer Announces up to $100 Million Freddie Mac Commitment to Address Fort Drum and Watertown Housing Crunch,” news release, November 20, 2006, available at www.senate.gov/~schumer/SchumerWebsite/pressroom/record.cfm?id=266131 (accessed September 29, 2008). 9. Alan Greenspan, “Proposals for Improving the Regulation of the Housing Government Sponsored Enterprises” (testimony, Committee on Banking, Housing and Urban Affairs, U.S. Senate, 108th Cong., 1st sess., February 24, 2004), available at www.federalreserve.gov/boarddocs/testimony/2004/20040224/ default.htm (accessed September 29, 2008). 11. Andreas Lehnert, Wayne Passmore, and Shane M. Sherlund, “GSEs, Mortgage Rates and Secondary Market Activities” (Finance and Economic Discussion Series 2005-07, Divisions of Research & Statistics and Monetary Affairs, Federal Reserve Board, Washington, DC, January 12, 2005), 1, available at www.federalreserve.gov/Pubs/feds/2005/200507/200507pap.pdf (accessed September 29, 2008). 12. Quoted in Gerald Prante, “Barney Frank on Fannie Mae and Freddie Mac in 2003,” Tax Policy Blog, September 17, 2008, available at www.taxfoundation.org/blog/show/23617.html (accessed September 29, 2008). 13. Carol D. Leonnig, “How HUD Mortgage Policy Fed the Crisis,” Washington Post, June 10, 2008. 14. Paul Krugman, “Fannie, Freddie and You,” New York Times, July 14, 2008. 15. Office of the Comptroller of the Currency, Federal Reserve Board, Federal Deposit Insurance Corporation, Office of Thrift Supervision, “Expanded Guidance for Subprime Lending Programs,” 2001, available at www.federalreserve.gov/Boarddocs/SRletters/2001/sr0104a1.pdf (accessed September 29, 2008). 16. Fannie Mae, “2008 Q2 10-Q Investor Summary,” August 8, 2008, available at www.fanniemae.com/media/pdf/newsreleases/2008_Q2_10Q_Investor_Summary.pdf (accessed September 29, 2008). 17. Neil Morse, “Looking for New Customers,” Mortgage Banking, December 1, 2004. 18. Fannie Mae, “2008 Q2 10-Q Investor Summary,” 20. 19. Freddie Mac, “Freddie Mac Update,” August 2008, 30, available at www.freddiemac.com/investors/pdffiles/investor-presentation.pdf (accessed September 29, 2008). 20. Zachary A. Goldfarb, “Affordable-Housing Goals Scaled Back,” Washington Post, September 24, 2008. 21. James Lockhart, “Reforming the Regulation of the Government Sponsored Enterprises” (testimony, Committee on Banking, Housing and Urban Affairs, U.S. Senate, 110th Cong., 2nd sess., February 7, 2008), 6, available at www.ofheo.gov/media/testimony/2708LockharttestimonyWeb.pdf (accessed September 29, 2008). The “unlimited losses” amounts to an EXPANSION from the $800 BILLION that Congress was going to authorize. Which is even more than the $787 billion stimulus, which was the largest government outlay in the history of the human race until the black hole of Fannie Mae and Freddie Mac beat it out. We don’t have any idea how expensive Obama care will truly be. You can bet your britches – and you may end up actually being forced to BET your britches – that it will cost a whopping load more than advertised. – 2009 (January) CBO estimated that the bailout TARP plan would cost taxpayers $189 billion; instead, several weeks later the estimated cost was raised to $356 billion, and will eventually be much more by end of 2009. – 1965 CBO estimated that Medicare Pt. A cost would be $9 billion by 1990; instead the cost was $66 billion in 1990. They were wrong by a mere 633%. Today the costs have exploded so incredibly that no one’s even bothering to go back now and try to figure out just how terribly wrong the forecasters truly were. 1965 CBO estimated that all (Part A plus Part B) Medicare cost would be $12 billion by 1990; instead the cost was $107 billion in 1990, and today it has a stratospheric total unfunded liability of $61.6 trillion. Oops. 1987 CBO estimated that subsidy for Medicaid special hospitals would be $100 million by 1992; instead the cost was $11 billion in 1992. There’s a nice 10,900% cost markup for you. Better luck next time. 1988 CBO estimated that Medicaid homecare cost would be $4 billion by 1983; instead the cost was $10 billion in 1983. But don’t worry; it’s only money. And being off by a mere 150% is actually quite excellent by the “close enough for government work” mindset. 2003 White House estimate of Iraq War cost would be $60 billion; instead the cost so far has exceeded $600 billion. Oh, well, if at first you don’t succeed, there’s always Afghanistan to screw up too. And like Mr. Creosote, it will be that extra tiny little bit of spending that finally causes the U.S. treasury to explode in a gory death. Instead of the mint that blows up Mr. Creosote, it will be a dollar bill that blows up the U.S. government. So when you hear the arguments over how much Obama’s health care “reform” will cost, realize that it isn’t a matter of whether it will cost $1 trillion, or $1.5 trillion, or $3.5 trillion; it’s a matter of whether it will cost one of those numbers times a factor of at least 10 or more. The $1.5 trillion figure, which is currently being thrown around, is enough of a sticker shocker even without the realization that it will actually end up costing far, far more that even Democrats – fearing losing their seats – are beginning to bail out of it. Still, the worse the plan looks, the faster Barack Obama wants it passed, before people know what a lemon they bought. 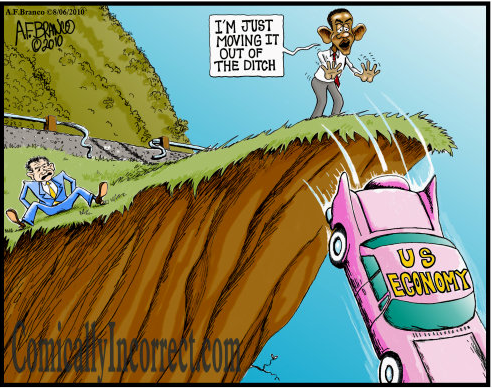 Obama has been claiming that we must immediately pass health care “reform” in order to save money in future years. He has pounded away with that message again and again. But that message is a complete lie. Doug Elmendorf, director of the nonpartisan Congressional Budget Office, was testifying before the Senate Budget Committee yesterday when he dropped a bombshell on the gathering that put a whole new spin on the effort by the Obama administration to reform the health care system. As we wrote in our letter to you and Senator Gregg, the creation of a new subsidy for health insurance, which is a critical part of expanding health insurance coverage in our judgment, would by itself increase the federal responsibility for health care that raises federal spending on health care. It raises the amount of activity that is growing at this unsustainable rate and to offset that there has to be very substantial reductions in other parts of the federal commitment to health care, either on the tax revenue side through changes in the tax exclusion or on the spending side through reforms in Medicare and Medicaid. Measured relative to GDP, almost all of the projected growth in federal spending other than interest payments on the debt stems from the three largest entitlement programs — Medicare, Medicaid, and Social Security. For decades, spending on Medicare and Medicaid has been growing faster than the economy. CBO projects that if current laws do not change, federal spending on Medicare and Medicaid combined will grow from roughly 5 percent of GDP today to almost 10 percent by 2035. By 2080, the government would be spending almost as much, as a share of the economy, on just its two major health care programs as it has spent on all of its programs and services in recent years. This double dose of doom has made absolutely no impact on Capitol Hill. Three House committees seem ready to report out a $1.5 trillion health care reform measure while the Senate Finance Committee appears close to a bipartisan deal on how to fund it — this, despite the fact that the CBO chief has told them there is no way to pay for it. It is like being in a bad dream where there’s a fire in a room where a dinner party is being held and you’re the only one who notices. Everyone else is still playing cards, eating, or sitting around having witty conversations, all the while the fire laps closer and closer. But it’s not a nightmare and lawmakers really are ignoring the fire. Elmendorf doesn’t come up with these projections to amuse himself and the wonks at CBO. He has outlined a recipe for catastrophe that will eventually make the United States a second rate economic power, not to mention impoverish the population. The president and Democrats have been pitching this plan as a cost-saving measure. The president especially has been warning that we have to pass this reform bill quickly in order to get control of the spiraling deficits grimly outlined in Elmendorf’s long-term budget outlook. But Elmendorf is saying that we can’t get there from here, that the numbers being used by Democrats to close the gap between what the bill will cost and how they plan to pay for it are simply not adding up. There is another aspect to this reform measure that few are talking about: history. Every single entitlement program ever created by the federal government has cost the taxpayer more than advertised — in some cases, astronomically more. Medicare is a perfect example. When the program was created in 1965, it cost taxpayers around $3 billion. At that time, the House Ways and Means Committee estimated that Medicare would cost $12 billion by 1990 — and that number was adjusted for a predicted rate of inflation. The actual cost of the program in 1990 was $107 billion. And today, Medicare costs the U.S. taxpayer $440 billion. At best, Congress is guessing. The fact is, no one knows how much this monstrosity is going to cost, no one knows how it is going to be paid for, and no one knows what effect it will have on the quality of care or on the private insurance industry. The ideas being implemented are untried. And, unlike NASA testing a new rocket or the Air Force testing a new fighter where failure is expected, there is no room for error. However this thing works itself out, we are stuck with it. History is a telling guide here as well; there has never been an entitlement once created that was later rescinded. Elmendorf’s testimony and budget outlook should be heeded. Yes, we need to reform the health care system — badly. But the Democrats’ plan is not the only game in town. There are many proposals left unexamined by the Democrats in their haste to give their president a triumph. The partisan nature of the debate, the deliberate closing off of alternatives that would cost far less and perhaps do as much as is being proposed, and the damnable rush to get it all done before anything is digested or weighed against the long term, is frightening. The major justification for speed in passing this legislation just went out the window with Director Elmendorf’s admission that the health care reform bill will only add many billions to the record deficits we will already be running over the next decade. Is that reason enough to slow down or even stop what the Congress is doing in order to think this thing through and try to come up with alternatives? Not when it’s easier to ignore the fire lapping at your toes in order to grant a political victory to a president in trouble with the voters. They say elections have consequences, and since the country voted for total Democrat control, we should let the Democrats have their shot. That may be true. But what we did as a nation in November was vote to slash our jugular veins, so that the blood of the entire nation (measured in the red ink of crippling debts) would gush out until we are left with less than a banana republic.